The New Year gets underway in Sydney with yet another dazzling fireworks spectacular. 2015 has been welcomed in tropical style by Sydney with a typically grandiose fireworks display. The Australian city’s traditional extravaganza is renowned for being the world’s best New Year’s Eve pyrotechnics show, and the latest edition did not disappoint. Approximately 1.6 million revellers flocked to the famous Sydney Harbour’s shores and waters to witness the spectacle as 7 tonnes of smoke, colour and sparkle lit up the sky. The theme for the 2014/15 Sydney New Year’s fireworks show was ‘Inspire’ with event organisers deploying 100,000 pyrotechnic effects featuring tropical colours and motifs. As ever, the iconic Harbour Bridge (including its crowd pleasing ‘waterfall of fire’ effect) and Opera House formed the centrepiece of the dazzling display, with fireworks also launched from a myriad of close by city buildings and barges floating amongst the thousands of spectator vessels gathered to watch. 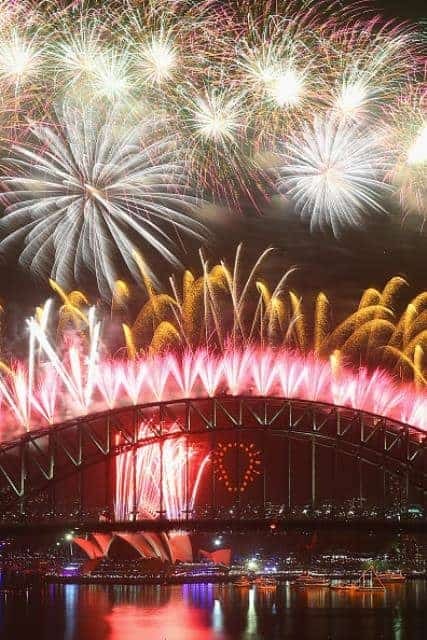 Eye’s now turn to the likes of London and New York to see how their New Year’s fireworks match up to the Sydney epic.